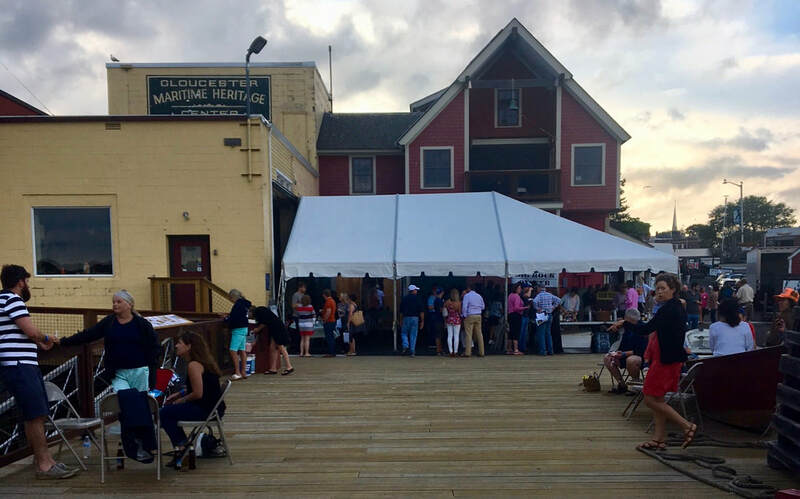 ​The Oysters on the Pier event at Maritime Gloucester was a wonderful success! Thank you to everyone who came and supported our upweller. Around one hundred people showed up including the Mayor of Gloucester which was pretty exciting. We had a tent set up behind the aquarium where we had tables for the oysters, drinks, merchandise, clam chowder, and raffles. A lot of people walked around the pier and enjoyed the view of the harbor. Thankfully, the weather held up and didn't rain as forecasted. The upweller was uncovered for the event and people got to take a look at the oysters and see what we've been up to. I was by the upweller towards the end of the event to talk about the oysters and answer people's questions. It was great sharing our project with more people and they all seemed so excited by what we're doing. A lot of people were surprised that everything in the buckets were oysters. They're so much smaller than the ones you eat but they've already grown so much since we've got them. They were like grains of sand at first and now you can clearly distinguish each individual oyster in the bucket. Speaking of how the oysters have grown, *drumroll please*, the correct answer for the number of oysters in the 2 oz cup from our last post is 986 oysters. We counted them again five days later and the number had already decreased to 726! We'll be counting the oysters every week from now on so be sure to comment with your guesses in future posts. Here you have Steve holding a 2 oz measuring cup filled with our oysters! The idea behind this is very similar to a contest many of us may be familiar with - look at the giant jar of of jelly beans and write down your best estimate of how many there are. Here at Maritime Gloucester we have put our own spin on it to keep the theme of oysters going! Each week we will fill this cup with oysters, count how many there are, post a picture, and ask our readers to take a guess at how many oysters there are. We will post the correct number of oysters for that week along with the closest guess we received before posting the following week's photo. Hint: there will be fewer oysters each week as they continue to grow. Be sure to comment your guesses below - this week is a warmup but there may be a real contest in the future so get practicing!! Also be on the lookout for a post with the correct number of oysters in the above photo. P.S. Check out this slideshow for some shots I took on Wednesday July 19th!! !